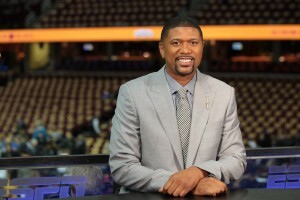 One of the preeminent stars in sports since his college days at Michigan as part of the Fab Five, Jalen Rose has always worn his heart on his sleeve both on and off the court. It was only natural for him to take his talents to media, as he began working in broadcasting during the mid-2000s. For the 2016 NBA Finals, Rose is providing on-site pre-game and halftime coverage for every game exclusively on ABC alongside Sage Steele and Doug Collins, the third consecutive Finals together as a trio. Moreover, his podcast with David Jacoby, Jalen And Jacoby, gained some much popularity online that it was picked up and altered into a national radio show by ESPN Radio and airs on ESPN 2. Source Sports had the pleasure of speaking with Jalen Roseabout this year’s finals, the marriage of sports and Hip Hop, being social conscious and so much more. If you’re a fan of Hip Hop and sports, this interview is definitely for you. Rocko Rathon: You previously said that you would never be opposed to coaching but your career in broadcasting continues to blossom. If the right coaching opportunity came along would you consider it or are you sticking to media? 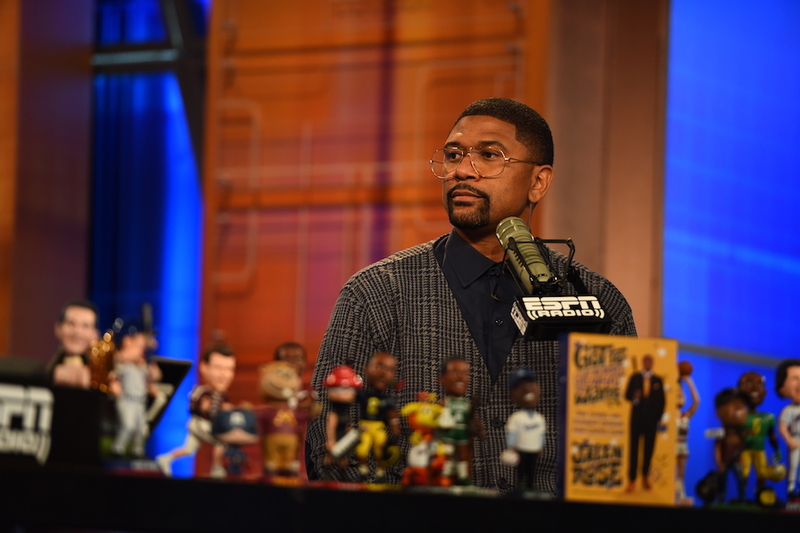 Jalen Rose: I would consider it because the one thing about basketball is that it continues to evolve and I love it so much. It does so much for me in my life. I’ve played on every level and I’ve been fortunate enough to be around greatness on every level. I love to inspire, I love to teach, so that is something that I would consider if the right opportunity at the right time presented itself. RR: You’ve always had a heavy Hip Hop influence from your college days at Michigan University to your pro days and even in broadcasting. In recent years, ESPN started leaning more towards Hip Hop, having artists as guests and even using rap as their theme music on programs. What do you think about ESPN’s move toward Hip Hop and would you consider yourself one of the main people that ushered in that movement in sports broadcasting? JR: Yes, along with the late great Stuart Scott. This is something that Stuart and I spoke about frequently. We spoke about not only being able to express and articulate yourself speaking sports but also doing it in a language that we’re used to expressing ourselves in and that’s the language of Hip Hop. As we know, rap is something you do with a microphone but Hip Hop is a lifestyle, it’s breakdancing, graffiti, how you dress, DJing. So to encompass that in my media is something that I’ve always been conscious of. I am happy that the coordinating producer on NBA Countdown now, Amina Hussein and another one of our directors Ty, we’re around the same age and she’s from Oakland, he’s from St. Louis and I’m from Detroit. So when you have a diverse group of individuals in a room, you got a lot of different opinions and backgrounds. Fortunately for us, we understand that the demo of the NBA is 75% black. So of course it makes sense for us to use Mobb Deep‘s “Survival of the Fittest” at last year’s NBA Finals or have DJ Premier & Royce Da 5’9. It’s not just album cuts or popular radio cuts, it’s true Hip Hop. You see the boombox, you see the kids breakdancing, you see The Roots now doing the NBA Finals promotion. It’s something that has truly evolved over the past few years and it’s something I always try to do on Jalen and Jacoby. If you notice, us being a national radio show that is now on TV, it’s important for us to show our personality. So if you see the pictures we have up, I have a Future with Cam Newton and Jeezy, Jayne Kennedy or Muhammad Ali because that imagery, nationally in particular, is something we have not previously been able to share. So to have an outlet that allows us to do that is really refreshing. RR: On your show, I think it’s really dope how you and Jacoby are giving fans a Hip Hop history lesson every episode with the music breaks. JR: Yes, because music is the heartbeat of everything that happens. It was always something that mainstream America directly or indirectly used to sell products, especially after the early 90s. I remember being in college, being in the NBA and the only song they played was “Whoomp There It Is.” So for us to progress to the point where on Christmas Day I see a LeBron James commercial and “Welcome to the Terrordome” is playing and I hear Chuck D‘s voice, I got the chills. It showed me that rap music in particular and Hip Hop artists have officially become mainstream and the torchbearers for a lot of product placement and what happens with the pulse of our society. 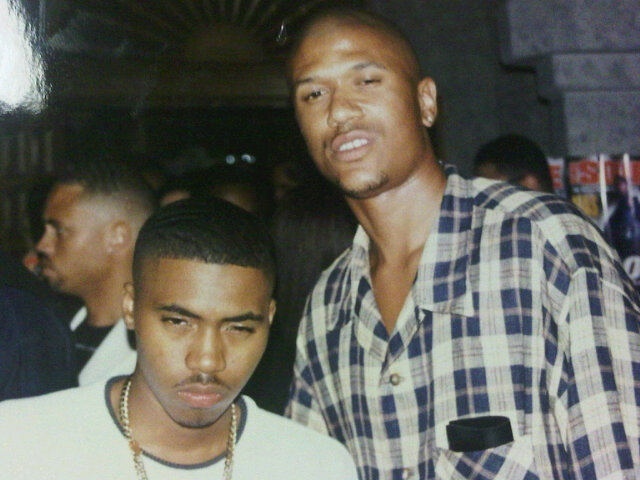 RR: You’re up there with Jordan and Kobe as one of the most name-dropped pro athlete ever in rap songs. How do you feel about being one of Hip Hop’s most beloved athletes? JR: Wow! That’s love! The great thing about it is, Jalen has now become a common name. I know I’m fortunate when I’m looking at the NFL & NBA drafts and players are now being picked in their 20s who are named Jalen. For my mother to make up the name, it’s a combination of my uncle Lenard and my father James, to see how that’s progressed, that’s one of the most humbling things that has happened to me. Besides being shouted out on songs, it’s dope because I’m a fan of the art and I don’t want to have an album, I don’t want to do anything but stay in my lane but I have such an appreciation for the art. Since going to the KMEL Summer Jams in the early 90s when they were the sun up to sundown concerts and meeting so many different artists, appreciating that they even knew my name. Staying in contact with EPMD and having Parrish give me my first Sky pager and some gear or Naughty by Nature at the time, rocking their hoodies and gear at the Final Four. Being in a video and movie with Ice Cube, those relationships continue to blossom. Having Master P as a friend and a mentor. These are some of the people that were the hottests artists out at the time. For them to know my name, it was humbling for me because I was also fans of theirs. So to be in videos with The LOX, to be shouted out on songs by Styles P, Sheek Louch and Lil Wayne! Thats love! RR: Back in the day I saw you on one of those hood DVDs with Styles P in Yonkers and I almost fell out! [Laughs] Right! I’m really fortunate that I’ve been on Broad Street with Beanie Sigel, I’ve been in Yonkers with The LOX, I’ve been in Illtown with Naughty By Nature, I’ve been in East Islip in the boondocks with EPMD. Those relationships continue to be nurtured and grown. I definitely appreciate the love and I’m really fortunate for the shouts in songs and multiple video cameos. I was Melyssa Ford for a while [Laughs]. I’ve probably been in 8 or 9 videos but what do you do when people hit you up and they want to show love and they want you to be a part of their project? I’m like, what time do you need me? that’s it. It’s funny because I was just at the airport the other day and I jumped out of the car and I look to my right, it’s Action Bronson. I gave him some dap, told him thanks for the shout in the song. JR: You know what I’m saying? Craziest part is, he’s standing next to Alchemist and he’s not even realizing that I’m going to know who he is. I’m like whats up Al? Whats going on? I know about that project with you and Mobb, what’s happening? It’s dope and it’s love because again sports and music are literally a soundtrack that go hand-in-hand, look no further than Muhammad Ali. RR: Perhaps the first ever rapper. JR: Correct! That is why that picture with Cam, Future and Jeezy mean so much to me because that’s a seminal moment that speaks volumes that a lot of people probably don’t understand, but I know that you understand [Laughs]. Quarterback, MVP, on the field with Atlanta homies, MCs. We know what they talk about in their songs and they’re standing on the sideline with gold chains on, no passes. Like, we’re with him, whats happening? Cam is like I got this. What up though? So I love that picture. RR: Since it was called The Jalen Rose Report back in 2012, on your show, you’ve broken down the day-to-day lifestyle of pro athletes for the public. Explaining how to “champagne and campaign,” how athletes manage or mismanage their money, the business aspect of sports and how it really works. What made you be so open about these things considering that other athletes that have gone into media haven’t been so candid. JR: Great question! You know when you have a good friend or family member and they’re seeking your advice but they’re only telling you 50 to 75% of the story. So because of that you can’t truly give them advice. Your advice may not ring true because they’re not telling you the whole story. I don’t like that [Laughs]. If someone can learn from my experiences, grow from them and take it to the next level or to learn what not to do, that’s almost a civil responsibility for your peers but also for those that follow you, support you and don’t get a chance to come behind the curtain so to speak. RR: You’re the founder of the Jalen Rose Leadership Academy, the tuition free, public charter High School. Is it difficult for you to oversee such a major endeavor while also being so active in your media career? JR: It’s something that I’m so passionate about and I’m so committed to that I’m going to always make the time. Game 4 of Cleveland and Golden State is on Friday, the next day I’m going to be at the JRLA graduation. It means a lot to me to be the founder of a tuition free Public Charter High School and try to help navigate and educate some young leaders. Nurturing them into being success stories. There are three stages. The stage of recognizing the problem, the stage of acknowledging, teaching and speaking on the problem but a lot of times we get lost on the third stage, contributing and doing something about the problem. You’ll see a lot of people tell us what’s wrong…but then hold on, where is your foundation? What time and energy are you spending to try to give back and represent? I take the lesson of Muhammad Ali, of Jim Brown. Civil leaders like Bill Russell, Kareem Abdul-Jabbar. They were politically and socially conscious even if it was going to come as a sacrifice to their brand or how they were viewed by the public. It is no accident that Bill Russell just got a statue in the Boston area but Ted Williams, who never won a World Series, has always had a freeway named after him. It’s no accident that Kareem recently got a statue in Los Angeles and I’m glad that both of those things happened. I’m old enough to remember the impact of John Carlos and Tommie Smith in the 1968 Olympics. I understand the civil obedience and the sacrifice that those athletes made that transcended the score of the game. It’s always important to me to try to live in that vein and follow their lead. RR: There has been talk that your home city of Detroit is being gentrified. What is your take on that? Is it good for the city and for the people? JR: It’s unfortunate that we see this in major metropolitan cities. You see it in Brooklyn and Harlem. You see it happening in Chicago, not on the south side or the west side though. You see it happening in Detroit, downtown Los Angeles. It’s happening across the country and something that continues to be an issue. The only thing that fixes it is to try to educate our young people and try to employ them so they can change the dynamic for their families. That is where the bar is now. Gone are the days in our country where we’re able to graduate from High School and perhaps eventually get a job that pays $100,000, that barrier has been put up. If you want to work at McDonald’s, where is your degree? Now that we see that this is what it’s going to be like, it is up to us to try to navigate so we can be in a position to own, to buy, to hire, that’s truly where it starts. We need to also continue to be disciplined, diligent and chase our goals. There’s a time and period for everything. You have to be conscious of what you post on social media because that can stop you from getting a gig [Laughs]. You can’t speak in public like you would behind closed doors. Appearance matters, what we wear matters. How we show up to an interview and our hair is not cut or cut matters. RR: Purely from a point guard perspective, who’s game do you admire more Steph Curry or Kyrie Irving? JR: Steph! He has shown me that he’s one of the most clutch players in a short period of time that I can recall. When he’s going to shoot the ball and they get a rebound in Oklahoma City and they don’t call timeout, he dribbles up with his left hand and he makes a 38-foot shot after he just injured his ankle earlier in the game. Nobody has done that…this is happening in real time. I’m not the type of person that just throws around all-time great accolades but he’s the best shooter off the dribble with the range that I’ve seen. When you try to play him like a one-trick pony, he also led the league in the regular season shooting 68% on layups, led the whole league. I like Kyrie I think he’s probably the second best ball handler and/or finisher to Steph Curry. While he’s shown me that he’s one of the best isolation 1-on-1 players in the league, he can get a shot off against anybody, I think that he can grow to be one of the shining guards in the league. Kind of like what we’re seeing with Damian Lillard in Portland, Isaiah Thomas in Boston or John Wall in Washington. I see him growing into that player but Steph Curry, Russell Westbrook, Chris Paul, they’ve established themselves as one, two and three. They’re on another level right now. RR: In the past two years, Steph literally became the face of the NBA, somewhat surpassing LeBron in terms of popularity. From an athlete’s perspective, do you think LeBron cares about that or do you think he only cares about winning a championship in Cleveland? JR: Here’s why Lebron does not care. He already exceeded expectations. He came out of high school, was the #1 pick, happened to be drafted by his hometown team, talk about that pressure. Then he goes and becomes one of the best players in the league but fans and media are like, you don’t have any rings! So he takes that off the table and goes, where is Pat Riley? I’m going to do what Shaq did, where’s Pat Riley? RR: One of the puppet masters. JR: Exactly! No question. He goes down there with Pat and Dwyane Wade, who by the way would have been one of his rivals. You would have never thought that in 13 years, LeBron truly hasn’t had a rival in the east. He played with Wade, he only played against Carmelo Anthony once in the playoffs. He beat Paul George twice in the Eastern Conference Finals and George got hurt. Derrick Rose was the only other MVP in the east and then he got hurt. That 6 straight NBA Finals appearance shows [LeBron’s] dominance. Plus, he’s became a mogul while he is still playing. The originality of Rich Paul & Maverick Carter being his agents and being his marketing people. Being so successful that they were able to branch off and now Rich is managing the #1 pick Ben Simmons and Maverick was managing at the time a Heisman Trophy winner in Johnny Manziel. They’re doing unprecedented things and LeBron is the leader of that. The ascension of Steph doesn’t affect his bottom line. So I don’t think he cares as much as people may think but what he does care about is losing his 4th straight NBA Finals appearance. He’ll care about that. RR: In regards to this year’s NBA finals, which do you think would be the bigger story? If Steph wins, is he one of the all-time greats, in Jordan territory or is it more meaningful for LeBron to win in Cleveland? JR: I think if we’re going from a league perspective, you have to go by the biggest team accomplishment which would be the one that had 73 wins and the only unanimous MVP in NBA history. Now if they can close the deal and have the back-to-back championships while [Steph] has back-to-back MVPs, he will only be the 4th player to do that. That’s Bill Russell, Michael Jordan and LeBron James. For Steph to join that category, so young in his career, I think that now that sets up the league for next year. Where you have the Thunder, I think Kevin Durant is going to come back, so it’ll be OKC and Russell Westbrook. Then you’ve got the Spurs with Kawhi Leonard, LaMarcus Aldrige and the Clippers if they’re back healthy. It’ll be great theater for the league. I still think the Cavs will be favored to win the East again. It would be a better story for LeBron and for Ohio since they haven’t won a championship in 52 years. League-wise though, I think seeing if the Golden State Warriors can close the deal would be the bigger story. RR: Who do you have winning the series and in how many games? JR: I have the Golden State Warriors winning in 6, here’s why. As you advance in the playoffs, your warts get exposed because you’re going against the better teams, that’s just how it works. One dynamic i’ve seen that plays so heavily in the Warriors favor…this is going to sound basic but when you watch your favorite player just think about this, they have multiple people that can actually dribble, pass and shoot. In game 1, Kyrie was able to get a lot of shots because at times he was the only guy that can beat his man off the dribble. The Warriors were standing next to JR, that’s why he only got 3 shots. The [ball] wasn’t in his hands, JR is going to shoot if he’s at the club, it wasn’t in his hands, they stuck with him. LeBron and Kyrie are the only creators on the team. There were 28 shots in the paint. For the Warriors, they have multiple people that can grab the rebound and push it up, at times they have 5 people that can do that [Laughs]. Look at how they’re winning, the reserves can carry the load. Shaun Livingston was one of the X Factor’s, why? There are going to be a lot of jump small lineups, players up to 6’9,” he can play multiple positions and he can dribble pass and shoot. RR: They didn’t respect the bench. JR: Yes! Correct! On the hip, boom, turn left, turn right, all day. Throw Andre Iguodala on LeBron, get the rebound, dribble, pass and shoot. Draymond, dribble, pass and shoot. Steph and Klay Thompson, dribble, pass and shoot. RR: Well that settles it! Thank you so much for your time, truly appreciate it. JR: It’s all love! The Source is the bible! So I’m honored! How about that? The Bible. The Hip Hop Bible. I know what it is. Catch Jalen Rose and company on-site throughout the entire NBA Finals on ABC! Also tune into to Jalen & Jacoby on ESPN Radio Monday through Friday 7 P.M. to 9 P.M. EST and on ESPN 2. Jalen’s autobiography “Got To Give The People Want They Want” is currently available on Amazon.